some days, you just wanna lay down. not necessarily go back to bed, per se, but just lounge a bit. 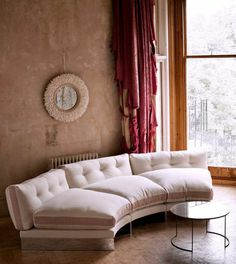 on those lazy days a chair just doesn’t cut it — one needs a proper chaise or daybed. the danish seem to have this design concept down pat, with their beautiful scandinavian daybeds and i for one am following suit. i work from my daybed on a daily basis and while it’s probably not ideal for my posture, it sure is cozy and relaxing. daybeds come in all styles and shapes — from modern classics like the eames, to vintage barcelona beauties, to cots and cozy cushioned diy built-ins. take your pick, and then take a nice long nap. • photography in order of appearance: morgane sezalory’s home via cup of jo; Birgitta Drejer via bo bedre; scandinavian daybed via super marché; sodapop design; remodelista; woo design; lacasa clothing; charlott pettersen; @dos_ombre; bolig; schöner wohnen; galerie half via sacramento street; the pink rug co.; barefoot styling; Line Klein via nordic design; herz and blut; kvarteret makleri; Peter Kragballe via bolig; bo bedre; remodelista.